Eleaf Pico Dual TC Kit is composed of 200W max huge power PICO DUAL MOD and 2ml huge capacity MELO III Mini tank. With the 510 Interface Conversion Kit, Pico Dual becomes the power bank to charge other electronic devices. In general, this kit is suitable start smokers. 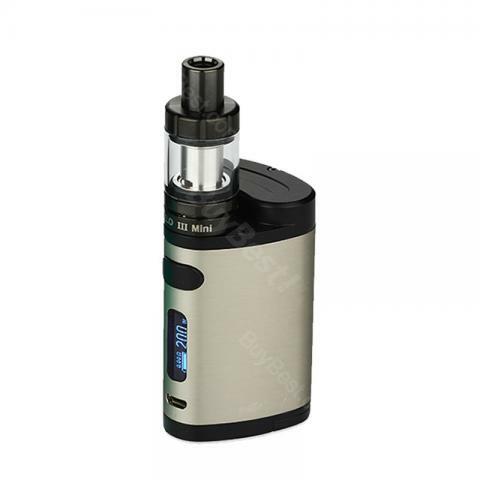 The Eleaf starter kit, Pico Dual TC Kit with triangular section design is easy to drip. Composed of 200W max huge power PICO DUAL MOD and 2ml huge capacity MELO III Mini tank. The Pico Dual is powered by 2 18650 cells (not include) with continuous discharge current above 25A, it supports VW/TC(Ni,Ti,SS,TCR-M1,M2,M3) modes. With the 510 Interface Conversion Kit, Pico Dual becomes the power bank to charge other electronic devices. Using top filling design, MELO III Mini Tank has simple structure, provides 2 finished coil: EC 0.3ohm and EC 0.5ohm. Eleaf Pico Dual TC Kit also features LED screen, it can remind you of necessary parameters. In general, this kit is suitable for starter smokers. I use a $5 discount coupon with this pico dual order. Now go look at other products on this website, thank you, for authentic product and cheap price! I received this mod at last. Still thanks for the kind customer services. Red eleaf tc kit for my fist vape device,like it very much.It's the best choice for starters. Came in as described time, and it is a good product at the cheapest price. It's the vape on the go! Pico dual kit is my favorite. And I order another one for my dad. Usually use the 0.3ohm coil with my pico dual and I am happy with the flavor and vapor production. I'm new to vaping and this is my first e-cig.Works very good for beginners. Very good product and very good website for vaping gear. Authentic! Not expensive! Purchased two pico dual kits for my wife and me. We are quite satisfied with the quality and performance. And buybest have impressive prices and good international shipping. It's a good handy size and i love it. The Eleaf Pico's the best kit I've ever got.The others cannot compete with this one. Deffo recommend! Good Eleaf kit for starters,also works well.Battery last long enough to for a day of use. Love my pico dual. It can not only satisfy my vaping needs but also act as a power bank to charge my other electronic devices. This is amazing!